We wish to extend a warm invitation first to AAAP members and guests, AAAP Facebook Fans, Wagman Star Party Fans, Mingo Star Party Fans, etc.! Update: Due to clouds there is no Rooftop Stargazing. Please join us at 7:30 pm for the Solarquest Presentation and guest speaker from DCNR’s Laurel Hill Complex, Kim Peck on astronomy opportunies at Laurel Hill, Laurel Mountain and Kooser. 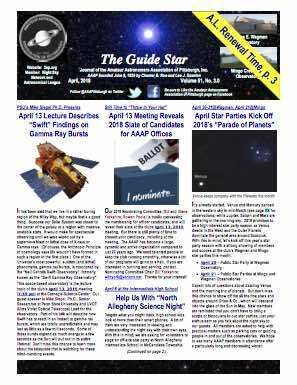 We will try again for a pre-meeting Meet and Greet with Roof Star Gazing (weather-permitting) at 6:30 PM at the Carnegie Science Center Rooftop Observatory, 1 Allegheny Ave, Pittsburgh, PA 15212. Dress to enjoy the fresh air. Enter through the Main Entrance.The meeting starts at 7:30 PM at the 1st Floor Science Stage. AAAP members remain for the business meeting after the lecture. Download the meeting flyer here or https://tinyurl.com/AAAPFeb9-2018 . Blast into orbit around the Earth with NASA’s Solar Dynamics Observatory, or SDO, our latest, greatest satellite for exploring the Sun! In this show, embark on a SolarQuest—a quest to learn about our star, the Sun! Learn how the Sun works, how we study it with our satellites, and how the Sun interacts with the Earth and makes life possible. Mike Hennessy, Carnegie Science Center’s Buhl Planetarium and Digital Media Manager will present on behalf of Carnegie Science Center, SolarQuest: Living with Our Star, a production jointly produced with Goddard Space Flight Center. Demonstrations and NASA videos make this lively and engaging production one not to miss! 1. Use Main Front Entrance 2. Follow planetarium staff to elevator for Rooftop Star Gazing or to the Science Stage for the Main Meet-ing. Minors are not permitted in Over 21 Night. 3. $5 Parking Fee by Credit Card only at Parking Lot Exit Gate or the Main Lobby kiosk . Rooftop Star Gazing Meet and Greet/Lecture, Free and Open to the Public. $5 Parking Fee by Credit Card. Updates on our website at www.3ap.org, on AAAP Facebook and https://tinyurl.com/AAAPFeb9-2018 . https://3ap.org/wp-content/uploads/2018/08/logo_web_2018-300x300.jpg 0 0 DeSantisK https://3ap.org/wp-content/uploads/2018/08/logo_web_2018-300x300.jpg DeSantisK2018-01-23 16:39:292018-04-03 14:49:37AAAP Meeting, February 9, 2018, "Solarquest - Living with Our Star"
Objective: To promote and encourage the profession of astronomy. Must be enrolled and accepted to study astronomy, physics, or mathematics. This scholarship is limited to seniors presently enrolled in High Schools located in either Allegheny or Washington Counties of Pennsylvania. Deadline for submission: Postmarked by April 1, 2018 – Award will be announced and winner notified by May 1, 2018. *This fund, administered by the AAAP, was initially made possible through the donation of an anonymous benefactor.